The decline in global trade volume was due to China, which imported virtually no RPE in 2018, versus 1.94 million tons in 2017. 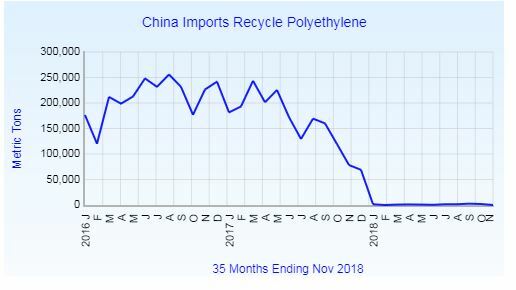 The loss of the Chinese market for RPE of 1.94 million tons was partly offset by higher imports into other Asia-Pacific markets, mainly Malaysia, Vietnam and Thailand. As a result, imports into the Asia-Pacific region in 2018 were down 46%, to 1.1 million tons, a reduction of 930,000 tons from 2017. Western Europe exported 909,000 tons of RPE in 2018, a decline of 38%. This was a reduction in exports of 557,000 tons from 2017, and, which was the additional volume that remained to be processed within the region in 2018. The 38% drop in Western Europe’s exports reflected a 52% drop in exports to Asia-Pacific, to 509,000 tons, as well as a 32% increase in shipments to Eastern Europe, to 305,000 tons. North America’s exports were down 29% in 2018, to 429,000 tons. This was a reduction in exports of 175,000 tons from 2017, and, which was the additional volume that remained to be processed within the region in 2018.